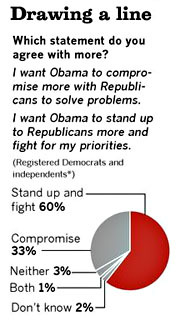 Remember those polls showing that Democrats and independents support political compromise far more than Republicans? And remember that Pew poll a couple of weeks ago showing that this was starting to change? Compared to four months ago, centrist-leaning voters were upwards of ten points more likely to think Obama should challenge the GOP more often. If this keeps up for a little while longer, the political landscape would look a lot different than it does now. Well, my friends, the future is here. In California, Democrats and independents are fed up. According to a new LA Times poll, a full 60% agree that “I want Obama to stand up to Republicans more and fight for my priorities.” If California is once again a bellwether for the nation, this is good news. Unfortunately, if California is once again a bellwether for the nation, it means the rest of the nation may soon be like California. This should give us all pause for thought.